Two days ago, I received my pack of 10 CC1 prototype PCBs from Seeed Studio. The excitement was too much, so I immediately started building the first CC1 prototype as soon as my wife got home from work. Not surprisingly, I didn’t go to bed until I completed the build, sometime around 3 AM. I knew it was futile to even try to sleep, as I’d just lie in bed wondering if I had messed something up with the circuit. The radio seemed to pass all of the basic checks early that morning, but had a few oddities that needed to be worked out. Yesterday, I was able to tweak some component values and got almost everything in line with my Manhattan-built prototype. I could hear a good rush of band noise as the antenna was connected, signals were coming in, and there was a stable 3 W CW output from the transmitter. Everything was looking great, but by the time the radio was ready to go QRV, 40 meters was closed and I was dead tired anyway. Tonight, I tried to make a first QSO with AA7EE, but 40 meters had already gone long by the time I was able to make it to the radio at 6 PM, and Oakland was well out of the skip zone. There were a lot of signals from Rockies and east on the band, so I cruised a bit looking for a CQ. No luck finding anybody CQing, so I found a clear spot just above the QRP watering hole and called CQ with the CC1 keyer memory. Right off the bat, I got a call from WA0JLY! We gave each other 559 reports, but he actually came up to 579 by the end of the QSO. It was a very short QSO, as just as we exchanged reports, I was called away to help with our 10 month old son Eli. So I apologize Denny for the cutting the QSO short and for my shaky fist! Earlier today, I made some special QSL cards to commemorate the occasion and WA0JLY will get the first one. I do plan on getting more on-air time with the CC1 over the next few months, something that I’ve set aside far too much while I’ve been doing design. So the initial verdict for this CC1 beta test is looking good. I will be getting in touch with the original beta testers soon and soon after that will contact those who requested to be in on the next beta (if you are one of those people and you don’t hear from me soon, feel free to contact me). As I’ve been saying recently, I’m cautiously optimistic about this board spin. I hope that I will be able to deliver a good product to my beta testers that has all of the original bugs eliminated. I’ve had a lot of people ask for details about the CC1 and I forgot that it has been a while since I’ve last reviewed the details about the rig on the blog. So here’s a quick list of specs. Please keep in mind that this is strictly preliminary and subject to change for the release version. @NT7S Congratulations on the successful build! Is it too late to sign up for the Beta of CC1? Congratulations on your first QSO with the CC1 Jason. To be honest I’m a bit envious, as I wanted to be the first, but I’m hoping that we’ll make it tomorrow (or very soon after). 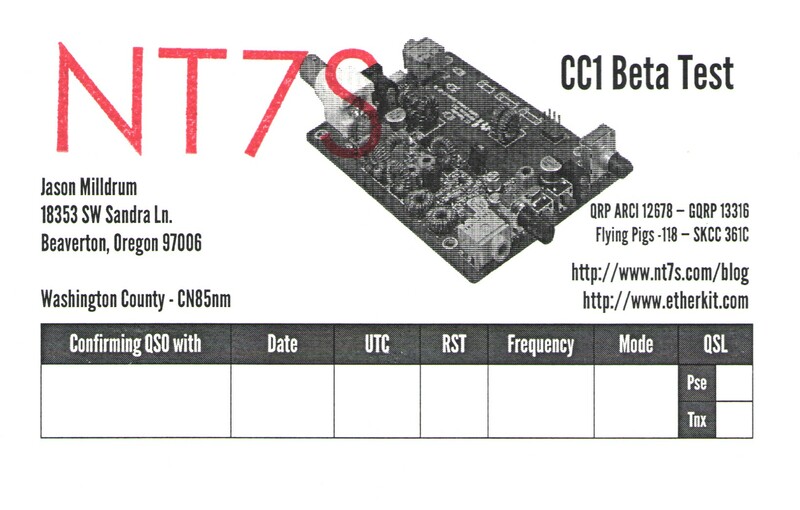 I want one of those CC1-Beta QSL cards! I love the fact that all the connectors and controls are mounted directly on the board – great for reliability and ease of building too. The picture of your completed board looks great. Your tenacity on this project is admirable. I sense a classic in the making! Jason — I agree with Dave. The radio looks very nice and I would like to acquire one when they are available. I, too, admire your abiliity. The CC1 looks great! I intend to keep a watch on this project and any others you do. Thanks! Looks good, Jason! Will you be spotting yourself on QRPSpots when you get on the air with this rig? Thanks for reminding me John. I’ll try to remember to do that! Sounds like a great project. I’ve seen tidbits about it on QRP-L. Question on PCB pricing as I’m trying understand their pricing matrix. Can you list your board size and final cost? Or give an example from your pricing. It’s not clear if the price is per board or total. For instance a 2 sided 5cm x 5cm board, qty 5, is $9.90. Is that per board or total? Yeah, the price they quote is for the whole batch of 10. 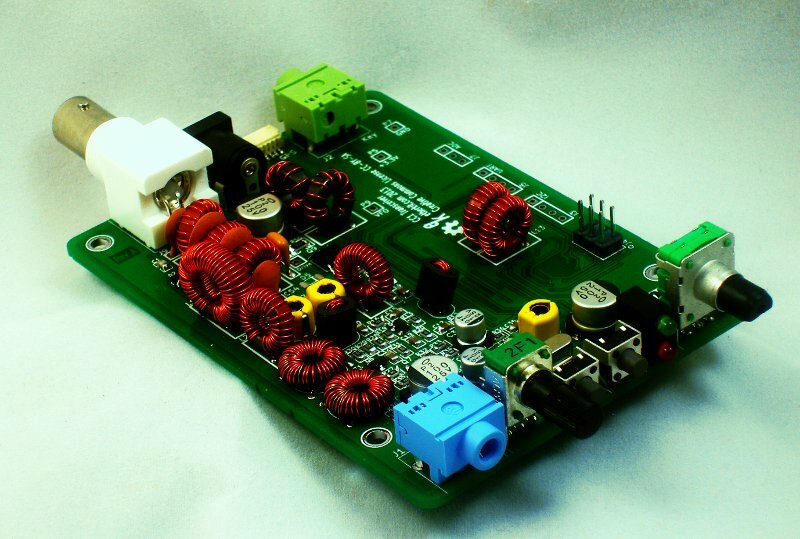 My PCBs are 70 x 100 mm, and I think it ends up being $14.90 (or so) plus shipping. Usually shipping ends up being the more significant cost on smaller boards, but it’s still a great price even with that cost factored in.